Makes ice cream in less than 40 minutes! Making ice cream is no fast AND fun! Great for entertaining at parties, picnics, and more! Make smooth, soft serve ice cream or quickly crush cookies, fruit, and more! 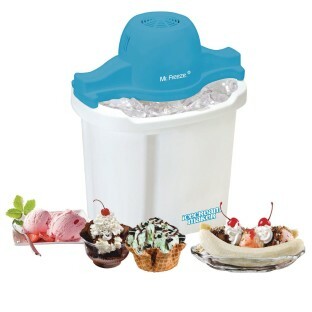 Makes ice cream in less than 40 minutes! 4-quart heavy-duty aluminum canister and a powerful motorized paddle make ice cream making fast, convenient and fun for the whole group! Great for entertaining at parties, picnics and events using all of your favorite ice cream, sorbet, gelato - even frozen yogurt recipes. The motor turns a six-fin paddle that whips air into the ingredients for a smooth, rich, soft serve ice cream. The paddle quickly crushes cookies, fruit, chocolate chips or a variety of other yummy toppings and thoroughly integrates them into the mixture. All parts remove for easy cleaning. Color may vary.